An ultra-rare 2.09-carat red diamond broke another auction record at Christie’s Hong Kong yesterday when it sold for an unprecedented $5.09 million, or $2.44 million per carat. The heart-shaped fancy red diamond, which now holds the title of most expensive red diamond ever sold at auction, puts an exclamation point on an extraordinary month of auction record breakers — two red, two blue, two sold by Christie's and two by Sotheby's. 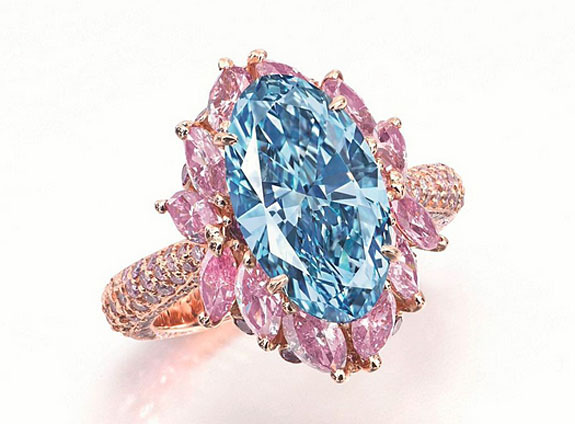 • On Monday of this week, we reported on a 9.75-carat blue diamond from the estate of Rachel “Bunny” Mellon that sold for an extraordinary $32.6 million at Sotheby’s New York. The fancy vivid blue stunner shattered two auction records, including the highest price ever paid for a blue diamond — and for a diamond of any color. • In mid-November, Sotheby’s Geneva established two auction records — including the highest price ever paid for a ruby — with the sale of the 8.6-carat “Graff Ruby” for $8.6 million. • Only a day earlier, the 392-carat “Blue Belle of Asia” sapphire set a world record for the highest price ever paid at auction for a blue sapphire when it fetched $17.3 million at Christie’s. Yesterday's record-breaking red diamond was scooped up by a private Asian investor, according to Christie’s. The selling price of $5.09 million was slightly above the auction house's pre-sale high estimate of $4.92 million. 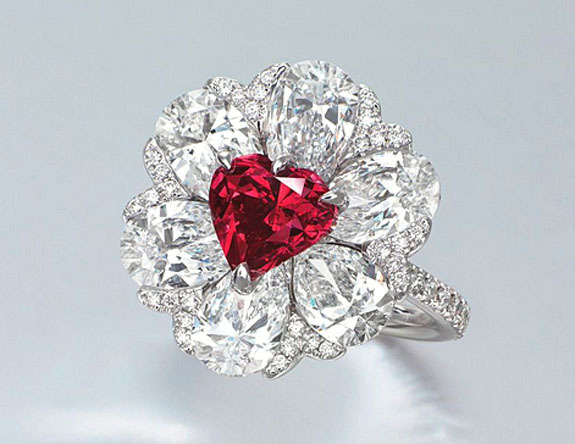 London luxury jeweler Moussaieff designed the ring in a flower motif with the heart-shaped red diamond as the center and six pear-shaped diamonds of approximately one carat in size representing the petals. Interestingly, Moussaieff currently owns the 5.11-carat Moussaieff Red Diamond, the world’s largest known red diamond and one of only three faceted red diamonds five carats or larger — the Moussaieff Red, the 5.05-carat Kazanjian Red and the 5.03-carat De Young Red. It is believed that red diamonds get their rich color from a molecular structure distortion that occurs as the jewel forms in the earth’s crust. By contrast, other colored diamonds get their color from trace elements in their chemical composition. For instance, boron yields a blue diamond while nitrogen results in a yellow one. Another top lot at the Christie’s Magnificent Jewels sale in Hong Kong was a 10.1-carat pigeon’s blood red ruby and diamond brooch by Cartier. 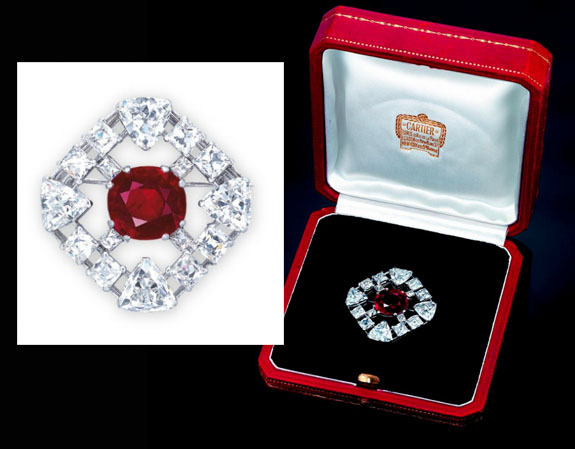 Selling for $8.4 million (more than double the pre-sale-estimate of $2.59 million to $3.88 million), the cushion-shaped ruby is the centerpiece of an openwork octagonal plaque set with square, rectangular and triangular-shaped diamonds. Christie’s third headliner was an exceptional 3.39-carat oval-shaped fancy vivid blue diamond ring also designed by Moussaieff. This ring carried a pre-sale estimate of $4.59 million to $6.47 million, and yielded $5.8 million at auction. The internally flawless blue diamond is surrounded by marquise and brilliant-cut pink diamonds in an 18-karat rose gold setting.